A visualization of the theory of special relativity in 3D VR, showcasing the main optical effects of the theory. Inspiration The unintuitive and difficult to imagine aspect of the theory of special relativity. 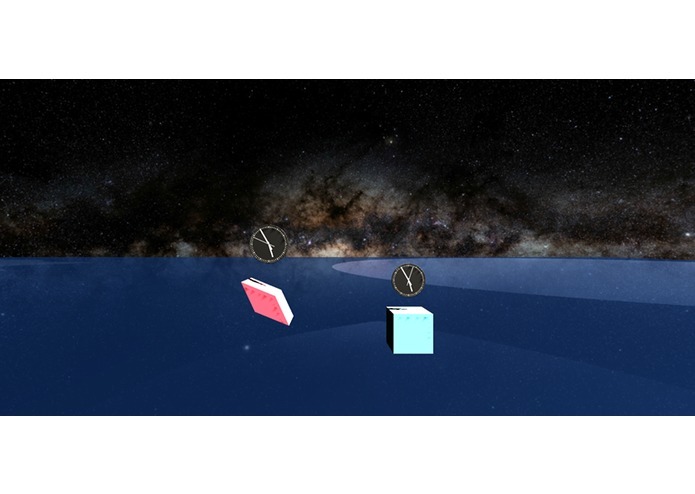 What it does Creates a VR environment that allow the exploration of the main optical effects of special relativity with objects traveling close to the speed of light. How we built it We used Unity as our engine for the 3D space and the transformations applied to the objects. Android SDK and google cardboard were also used to adapt the simulator as a VR expirience. Challenges we ran into The equations of special relativity become hard to manage in 3D space, allowing for movement in any of the 3 directions. We struggled to create a shear function and apply it to the objects we created. The effect of time dilation was also difficult to code due to the many factors involves. Accomplishments that we're proud of We succesfully created a shear function that recreates the theoretical results of lorentz contraction for an object moving in any direction in 3D space. What we learned We learned to adapt a 3D space to a VR environment through google cardboard´s sdk. What's next for [Mesa #17] - Relativity VR. Complete the planned scenarios (lorentz contraction, time dilation, loss of simultaneity, doppler shift) and eventually make it a more interactive and didactic experience where the user can create it´s own scenarios and alter them on real time.